Shaving brush. Who never tried it? I know it's winter... Cold and rainy even here in SE FL... Thought I would share this experience. I've used aerosol shave cream most of my life, not thought much about it. Christmas, I bought the wife an bunch of Clinique products and gift certificate, so as planned, she exchanged for the right stuff, and she bought me a tube of the Clinique Creme Shave for Men. I was genuinely impressed, it really made my face feel better and the shave was cleaner, I do like it a lot. Then it ran out, so I don't put it on our 'pick up list' in the, I do it my way, go on line... $20 for a 4oz tube! I am buy no means cheap, especially on myself, but damn... I decided to try something my father did, buy a brush and try it. Wet the brush with warm water, wipe it on the bar of shave soap in the little tub, apply. It feels great. Right there with the Clinique, and the warm feels great. Just saying, if you haven't tried a hot shave applied with a badger hair brush, I recommend giving it a try. 805gregg, cohea, jgatorman and 2 others like this. Last year i stumbled across the West Coast Shaving Club (no affiliation). Bought a brush, safety razor (the kind our dads used), shaving soap, cup, and really good blades made in Germany. Haven't used the Bic style blades since. I really like the shave I get. I've been using a safety razor, brush, and soap for five years now. It is in every way more superior to cartridges and cans and costs much less too. Great blades are cheap and one disk of soap last me a year. No razor burn nor irritated skin ever. Fish_DOut and kgearhart like this. I don't do that but now wondering why I don't. My old barber would give you the hot towel, brush on the soap and a straight razor shave for $5. One of the life's simpler pleasures that is sadly dying. I tried it for about six months with a high quality set. I just cut my face so much that I scaled back to shaving only 3x a week. I thought that maybe my skin would eventually acclimate to the safety razor, but I was using that stupid styptic every single time. I eventually gave up and went back to Gillette quads (or whatever they are) and am so much happier. You may need to try diferent blands and/or razors. I was using Feather blades, which came highly recommended, and had the same problem as you. Switched to Swords, and have not had any similar problems. You can find sample packs on Amazon, try a f ew different blade brands and see which one works best for you. i don't even use soap, I use a hot wash cloth in the shower. I shave right after a hot shower, and do not use any soap. misread the subject, and this isn't near as exciting as discussing shaving bush. mattttt25, Fish_DOut, Devil_Inside and 1 others like this. Man you can spend large for a top quality brush'n cup.....I think I've seen them over $250. I've got an antique ivory handle brush and stone cup around somewhere.......I support a beard and use an electric trimmer to keep in under control. I use a bowl & brush, with Mitchell's Wool Fat soap I get from Amazon.One puck lasts for months. I used to use triple blade and quad blade razors, and they beat up my face and cost quite a bit. Then I switched to super cheap single-blade disposable razors, the kind that come 10 or 12 in a pack for $1. I grab a new razor on Monday, and then throw it away on Friday after shaving. I take the weekend off. The combination of giving my face a rest on the weekends, using shave soap, and not reusing a blade after 5 days seems to work well for me. I have been using an inexpensive drug store brush and Williams shaving soap for many years, works well. Maybe after I hit the lottery I will try some of those fancy brushes and soap. There is nothing like a barber shave, but a safety razor comes close. So does your medicine cabinet have a place to dispose of the used blades ? I’m just reminiscing the old times, when I used the double edge blade. Rags and Fish_DOut like this. I think I was using Sharks, which were recommended for beginners to safety razors. I want to like this, and I'll probably try the Feathers brand. But I also feel like I quit thinking that it was pretty stupid of me to not take advantage of improved tech of the modern 4-5 blades. 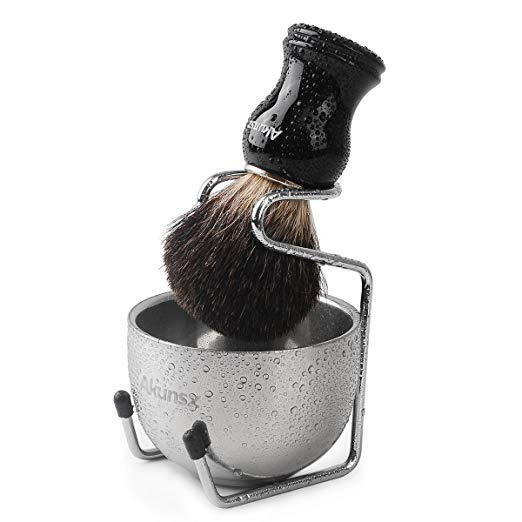 I have a mink shaving brush I keep in a Yeti mug, and use the best German blades custom made for the radius of my jaw. I send them a laser scan of my face and they contour the blade to match it.